Globe Trotters are wont to agree that no­where else in the world is aquatic sport pre­sented in such alluring form as on San Diego Bay, he beautiful sheet of water which forms our most southerly port on the Pacific Coast. Not only is this landlocked sheet of water, with an area of twenty-two square miles, exceptionally attractive from every standpoint, but the fact that this section of Southern California enjoys the most equable, climate on earth makes it possible to indulge in water pastimes every month in the year in this region of per­petual spring. Aside from its fame as the ideal marine playground San Diego Bay has gained world-wide distinction through several unique features of life on the waves as here presented, the most notable of which is the extent to which young women par­ticipate in these health-giving exercises and particularly in rowing. Whether it is the climate or the surpassing beauties of the Bay or some other magnet which attracts them might he difficult to deter­mine, but certain it is that nowhere else on the globe is there presented the inspir­ing spectacle of several hundred pretty young oarswomen rowing regularly twice or thrice a week the year round with a stroke that would put to shame many a masculine crew. 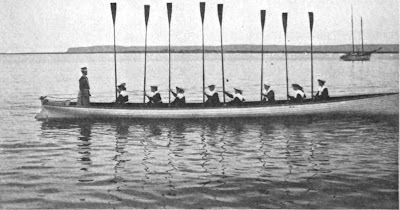 Rowing was first systematically under­taken by the young women of this climatic paradise more than a dozen years ago, the first step being the formation of a girls' rowing club by four young ladies whose given names were Zulette, Lena, Agnes and Carrie. The name "Zlac" chosen for this pioneer organization was formed it will be noted, by a combination of the initial letters of the quartette of members. The La Faluca and Columbia Clubs were organized in the year 1894 and other organizations followed in quick suc­cession, but the Zlac Club continued in existence and now numbers more than sixty members. The barge owned and used by the sailor maids of this Zlac Club may be briefly described as typical of the boats pushed through the water by these strong-muscled belles of the Pacific Coast. The Zlac barge is forty feet in length and three feet four inches beam and is covered on the outside with canvas, heavily painted white. The inside of the boat is finished in natural wood, shellacked and heavily mounted with brass. There are eight slid­ing seats with a lazy-back for the captain. 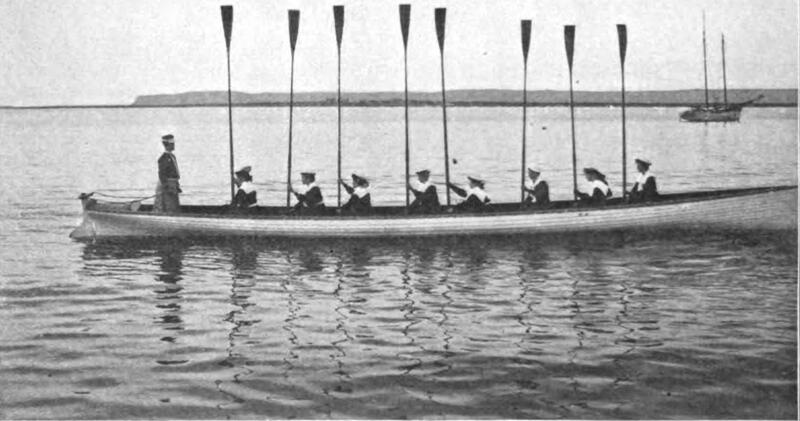 The rowers use spoon oars, fourteen feet in length, from which fact it may be appreciated that the handling of such a boat is a task to test the strength as well as the skill of the fair rowers. The barge, which is the proudest pos­session of the Zlac girls, cost about $900, and nearly the entire amount was raised by the energetic mariners. The young women have also erected a pretty club house that cost $1,000, bonds being issued to meet the expense. These bonds, it may incidentally be explained, have nearly all been redeemed with money raised by means of dues, initiation fees and the pro­ceeds of entertainments given by the club. 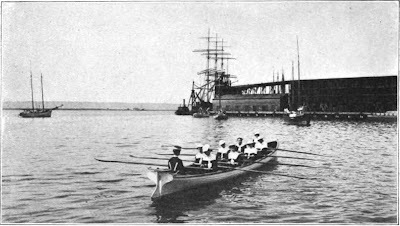 This club, which may be cited as an example of the other organizations of oarswomen at San Diego and Coronado, now has within its membership four row­ing crews, each crew having a separate government, crew officers, crew rowing days, crew flags, etc., yet all divisions being subservient, of course, to the general club executive management. Each girls' rowing club has its own distinctive club colors, combinations of blue and white and red and white being especially popu­lar. The Zlac Club has black and yellow as club colors, the crew pennants consist­ing of black fields with yellow border and one, two, three or four stars, according to the crew to be designated. The individual life of the respective crews extends to meetings and social func­tions, but on the first of every month there is a club meet and supper in which the entire enrollment of the organization participates. In most of the San Diego rowing clubs married women are not elig­ible to membership, but if a member mar­ries she is retained as an honorary mem­ber. Every member of such a club is expected to be proficient in swimming. If she cannot swim when admitted to mem­bership she is allowed one year in which to learn. Oft-times under the more or less mischievous tutelage of her sister oars­women. Girls under fifteen years of age are not admitted to any of the clubs, and the average age of the entire body of sailor maids is probably about twenty years. A candidate for admission to a club is first voted for by the crew of which she would become a member, and if this verdict be favorable her name is thereupon passed upon by the entire club. Each crew rows at least once each week and perhaps sev­eral times within the interval. Most of the rowing is done during the afternoon hours, principally from three o'clock until dusk. Some pessimistic folk are wont to de­clare that the opportunity to wear fetch­ing sailor costumes is one of the prime incentives to membership in these organizations of oarswomen. Certainly the average San Diego maiden appears mighty attractive in the garb of a mariner. 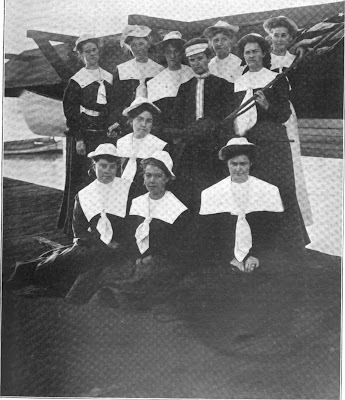 As evidencing the manner in which color schemes are worked out in these costumes there might be cited the uniform of the Zlac girls, which consists of a black sailor suit, trimmed in yellow braid, with yellow vest piece and yellow tie and a sailor's black "tam." The pre-eminence of rowing as the most healthful of exercises could not be more convincingly demonstrated than by the spectacle of one of the San Diego crews of young oarswomen placing their craft in the water and embarking. The girls carry their barge out of the boat house and unaided lower it four feet or more into the water. During this opera­tion two of the girls are stationed at cap­stans while four of the young women heave on ropes with double pulleys. As soon as their craft touches the water the girls slide down the ropes and, taking their seats, await the pleasure of their captain. Rigid discipline is enforced and the rowers are not expected to make any unnecessary movements in taking their seats—precau­tions in this respect being essential since the rowing shells are so light and narrow that any disturbance of the equilibrium will upset them. When the San Diego feminine rowers are bending to the oars in regulation racing trim each girl rows one oar grasp­ing it firmly in front of her with both hands and bending her back instead of crooking her arm in making the sweep. The coxswain sits in the stern, facing the crew, and gives orders for shortening or lengthening the stroke, incidentally steering the barge. After each practice row the girls draw out their boat and wash it down, leaving everything ship­shape for the next crew. The racing stroke of the champion crew of the Zlac Club is 36 or 38, but they have a record of a stroke of 42 in certain hotly-contested races with rival feminine crews. The skill of the San Diego girl rowers has been most highly commended by United States naval officers and well-known oars­men from Yale and Harvard who have at one time or another coached these fair experts of California. No mention of rowing on San Diego Bay would be complete without reference to the eight crews made up of the young women students of the State Normal School of California, which is located at San Diego. Some of the independent organizations of oarswomen on the Amer­ican Riviera have chosen rather fanciful names as witness the Olympia, La Sirena, Columbia and Lascouarias clubs. All told, there are now fifteen girls' rowing clubs in San Diego and vicinity, and there is every prospect that within a few years more we shall see thousands of sailor maids afloat where now we have hundreds.